The Grease Trap solution is designed to collect and therefore reduce the amount of fats, oils and greases (FOG’s) that enter the main sewers. Grease entering the main sewer system will over time create blockages, foul odours and pest infestation. Grease traps have been in use since Victorian days and in simple terms are boxes positioned within the wastewater drain run from the sinks and appliances in a kitchen to the foul sewer system. 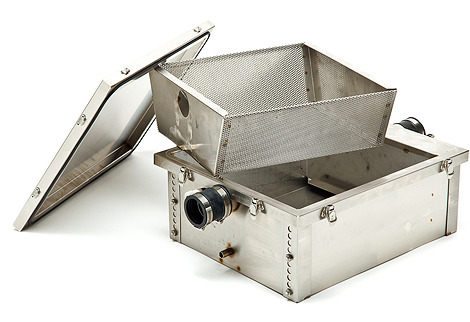 Grease traps work on the basic principal that FOG’s float on water and solid particles sink. Baffles within the trap slow the inflow of wastewater from the kitchen sinks. This allows for a settlement period where the separation of oils, water and food particles within the unit. A trap on the outlet prevents FOG’s from flowing directly through the unit with the FOG’s retained within the unit along with food particles allowing clean water to flow through. Where Should Grease Traps Be Used? Revised Building Regulation requires all new builds and refurbishments of hot food premises to have an effective means of grease removal on site. They are required on all sites that prepare hot food for the public or staff.